minimum requirements: Windows 10, 8.x, 7, and equivalent Server versions. functional limitations: You can create two secure USBs and use them for 30 days. you can also specify the expiration date and expiration number if you pass secure USB to others. 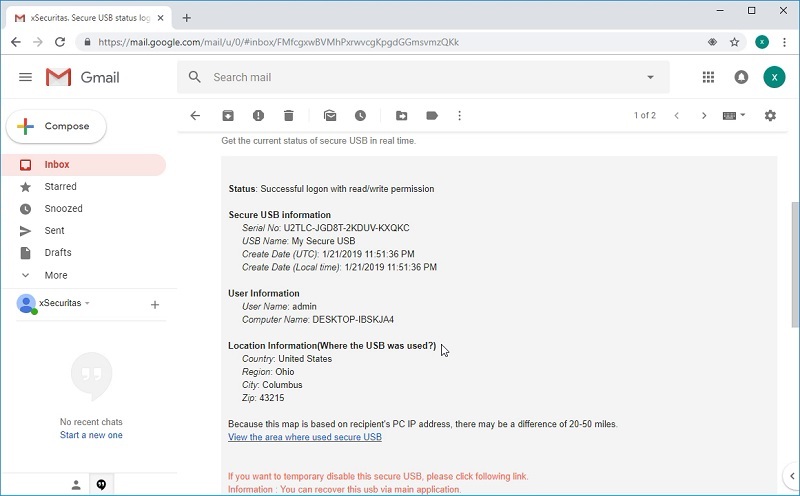 Secure USB usage logs sent to you can be received by your email in real time . The logs include PC information using secure USB and when and where secure USB was used. Of course, you can remotely disable or discard secure USB, so you can prevent data leakage even if you lose your secure USB. * You can change the general USB Hard Disk or USB Flash Disk to an encrypted secure USB. * You can specify an expiration date and an expiration number when creating a secure USB. * The documents are hidden in a secure USB, which can be retrieved only by entering the password. * A secure USB can be read / write or read-only. * You can change the policy for this secure USB even after creating a secure USB. * You can view logs for a secure USB in real time. * The log can be received by e-mail, and you can check the time, country, and local information using Secure USB in the e-mail. * You can immediately disable secure USB in your mail. Hide Secret Files (Popularity: ) : Hide Secret Files is a security product based on an unequalled data hiding method. As a result of many years research within our company, this product hides and safely protects from erasure your private information. Secrets Protector Pro 2006 (Popularity: ) : A three-in-one privacy protector tool built for those who like their personal stuff handled carefully. This product gives you the features of a folder locker, a secure eraser and a privacy manager. Safe HTML (Popularity: ) : Safe HTML script cleans up HTML by removing unwanted tags. It is suitable when you want to allow some HTML in form content that is to be posted on a HTML page, but don't want to risk ruining the page.